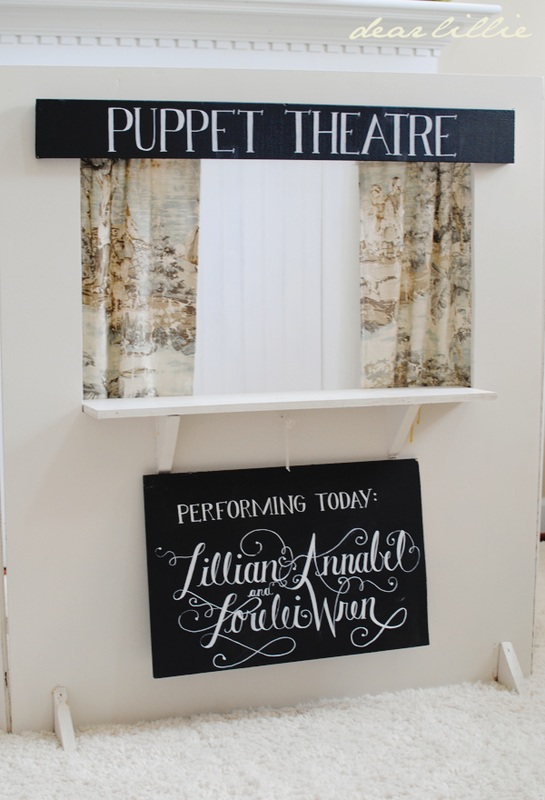 Quite a few of you guessed correctly that the lemonade stand we showed on Monday was also a little puppet theatre. I have to say this has turned out to be such a fun project! 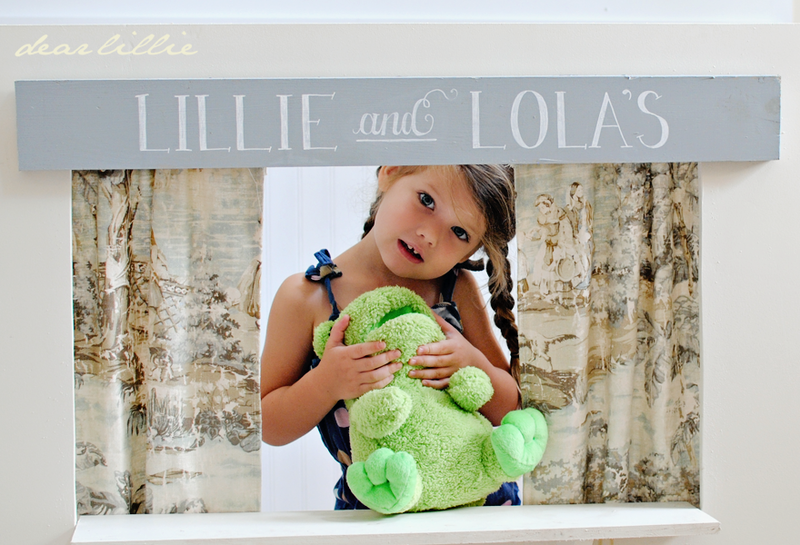 Along with a puppet theatre and lemonade stand, Lillie has also turned it into a "Doctor's Office" and an "Ice Cream Shoppe". I will show you both of those at some point, but for now here is how it transformed into a puppet theatre. 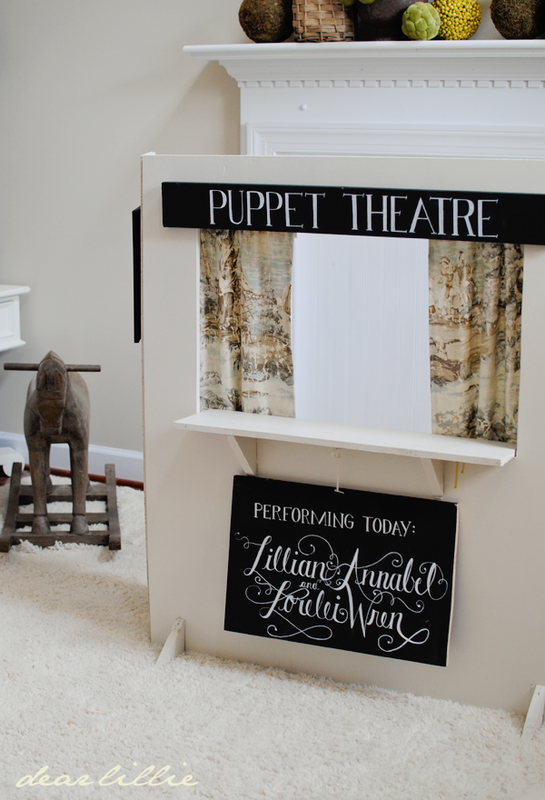 It was really quite simple - we just swapped out the signs (they are all on little nails which makes for super easy switching) and then added a little tension curtain rod and two little curtains and that was it - an instant puppet theatre. 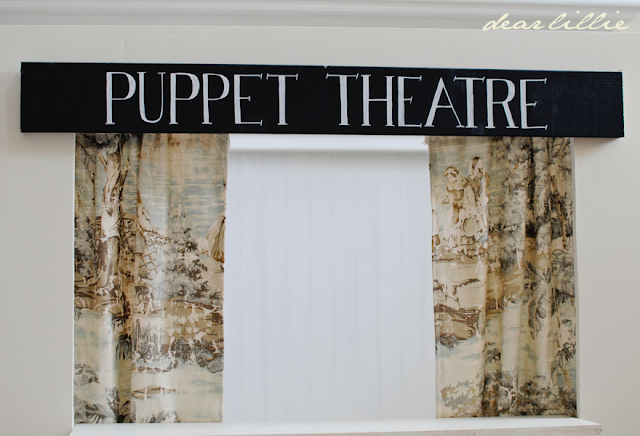 I will show you all the full tutorial on how to make the basic frame and then make it go from a lemonade stand to a puppet theatre once I have time to go through all the step by step pictures and write it out. Hopefully at some point in the next few days. We made little "posters" that said "Starring Lillian Annabel, the World Famous Puppeteer", and one with Lola's picture and name too, and then just popped them in frames from the dollar store. 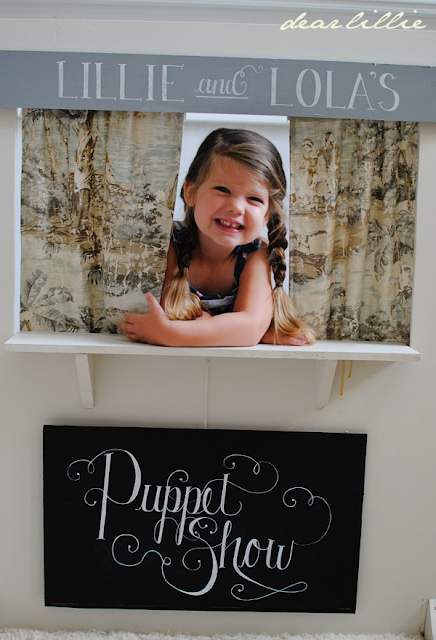 Because the signs are all interchangeable I could put this one from the lemonade stand back on and just have "Puppet Show" written on the little chalkboard below. 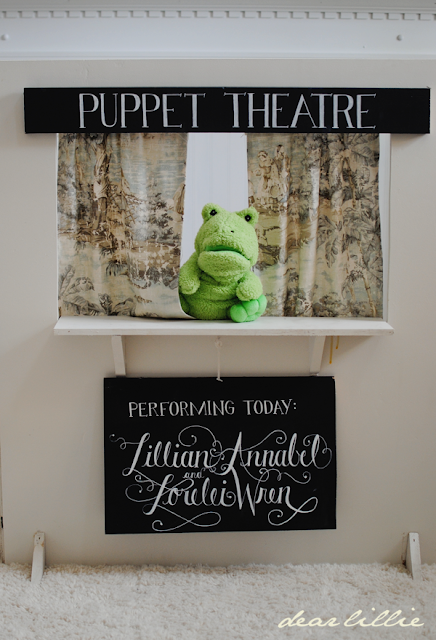 I was very nicely informed that there were no photographs during "conformances" (what Lillie calls performances) so I didn't get any shots of any of the actual shows I have been ever so priveleged to watch...over and over and over.... =) But I did get a couple of Lillie showing me the stars of the show, the puppets. Our sweet little neighbor Chloe let Lillie play with some of her handmade puppets. We moved the little ottoman over in front of the theatre to provide seating for the "audience". I have a feeling our living room is going to be looking like this for a while now. 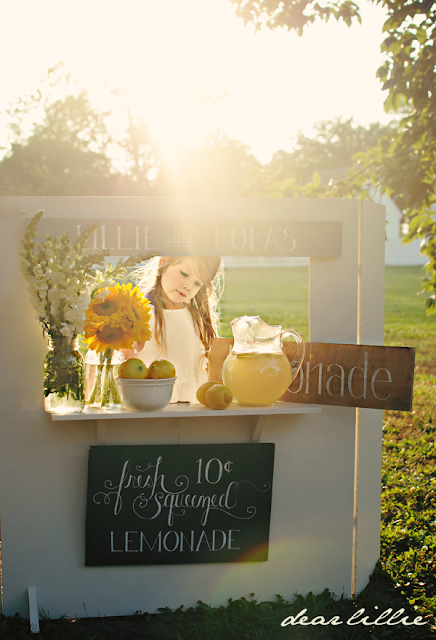 And if you didn't see our lemonade pictures Monday here are a couple. 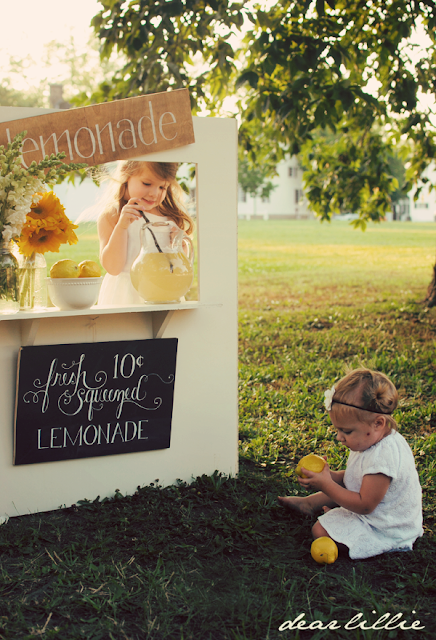 You can see a ton more lemonade stand pictures by clicking here. 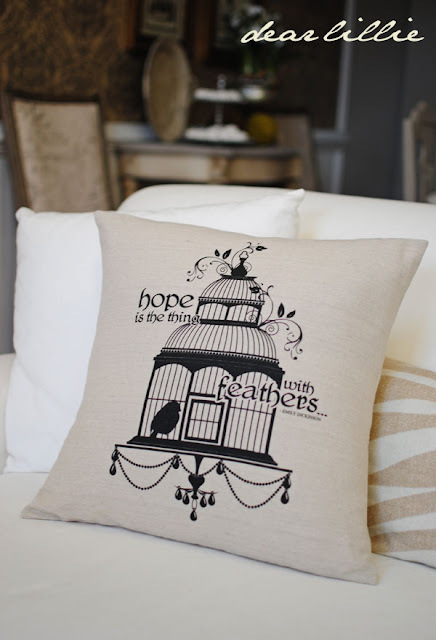 I also wanted to let you all know we have restocked our "Hope is the thing with feathers..." Pillow Covers. They are available both individually and as a set. Have a beautiful Thursday! And don't forget there's still plenty of time to enter to win one of our growth charts in the post below! Haha - you sound like me! This is just precious. And to think that you are taking time out and making these memories with your little girls! So adorable! 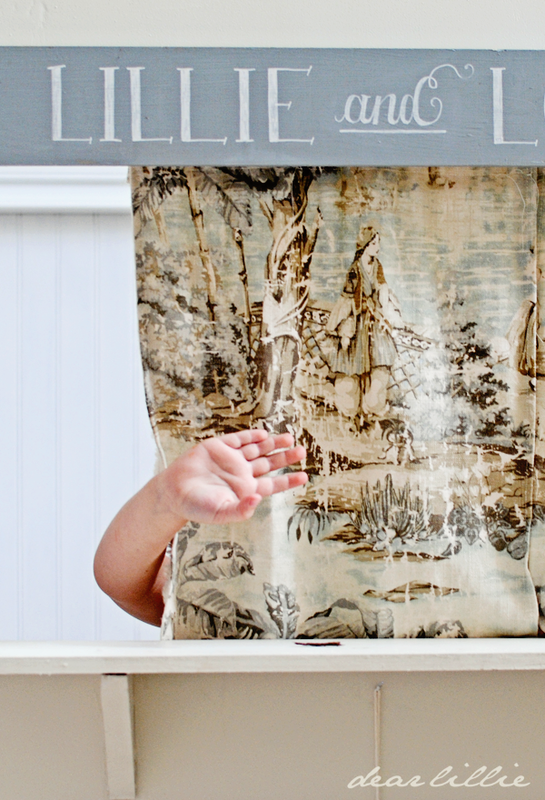 How does Lillie know that there are no photographs during "conformances"? What a pro! So sooo cute! I adore the fabric. It' so beautiful. Pillows?? This could also be a bank or McDonalds drive through. I know how my grandkids always love to play this stuff.Ready for summer play! Just need a play car or Cozy Coupe to drive up. you are such a cool Mom! I'm feeling seriously deficient in the mothering department lol. Your daughters are too sweet! My kids have a puppet theater that we hang in the doorway and I have loved watching them put on shows alone and now together! :) Enjoy it!!! Thanks! I will try to figure out how to do a tutorial! I like Chopin Script and Edwardian Script for computer fonts. Such a cute idea , wish my kids were small so that I could do one as well. I bet your girls had a blast.. 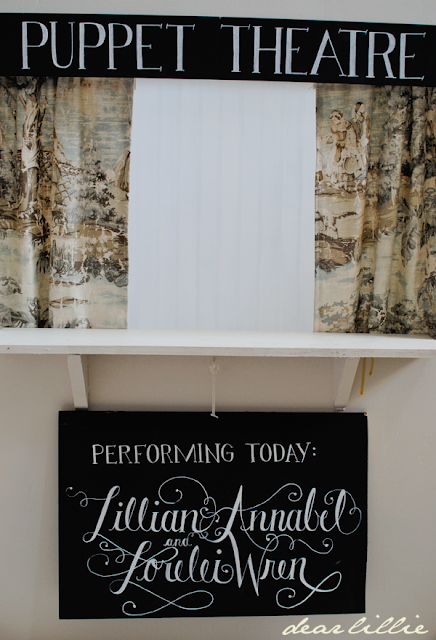 I love the "no photos during the performance"..
One of the most adorable ideas. Perfect timing for summer. I absolutely can't wait until I see the tutorial. I will put my other summer projects on hold to do this. I showed the pictures to my son and he loved it too! Now I just need to know where I can get some "Jennifer stencils" - I love your handwriting! P.S. 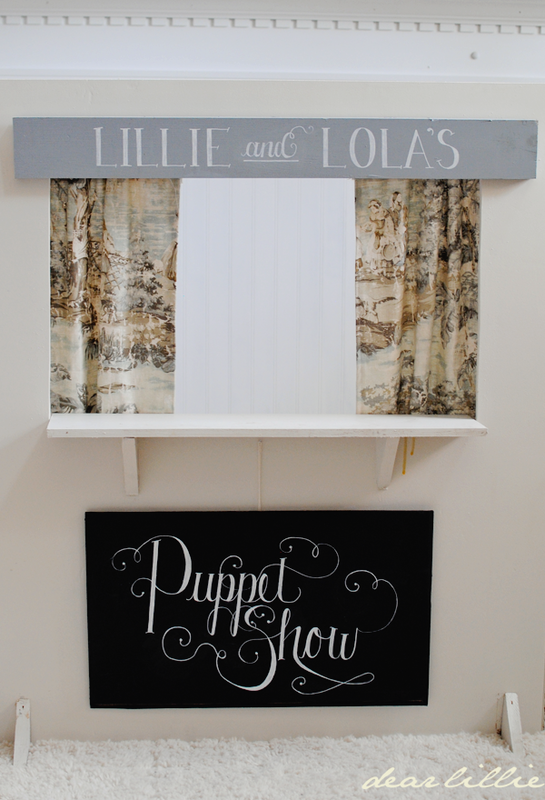 ~ Been wanting to make something just like this for a while now... last summer we made a "quick and easy" version using a cardboard trifold display board! My kids "decorated" it and did puppet shows all summer long! Oh fun! 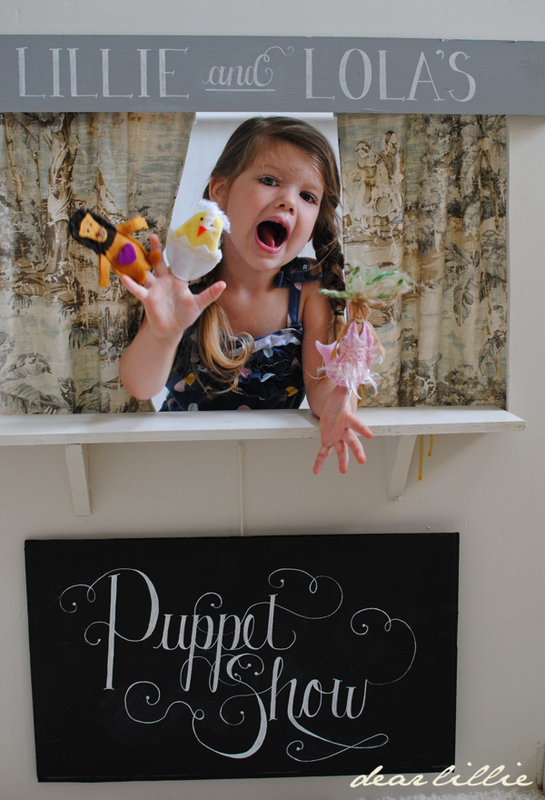 We are planning on making some popsicle puppets too! It turned out so cute Jenni! Glad I got to see part of the process! I am consistently in awe of you and your incredible creativity AND execution. Both projects are amazing. The girls are beyond gorgeous. I would also like to know how you do the beautiful handwriting. When I have a detailed look at it I still don´t know how you can do it so perfectly, almost like a font..please give us a know-how for it and show us what kind of chalk you use for it (round one or a square?). Maybe in something we could print out and try ourselves. There must be way to learn it. ;) I have a piece of wall with the blackboard paint (inspired by your tutorial). Thank you! We did used to offer templates of many of our designs so people could copy them and use them for their own projects. We wanted people to use them for their own personal use or gifts but requested they not be used to sell items. Unfortunately we started finding items for sale over and over and over =( so we finally removed all of the templates. I hate that we had to do that. =( Maybe I could try to do a step by step tutorial though or something on how I do it? Is it weird that I feel so grumpy and protective to think of people being so dishonest with your work and original designs!?! Lol! I guess that's what happens when you're so talented... : ). How disappointing and sad though! 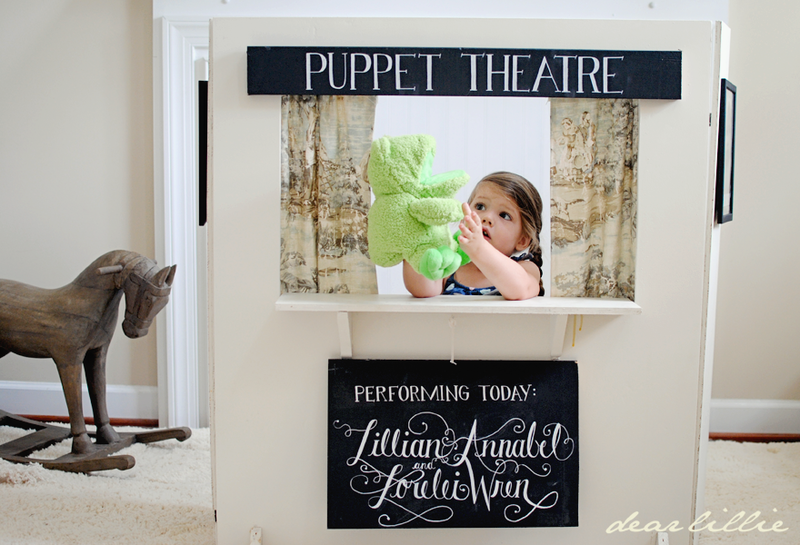 PS.... ADORABLE puppet theatre/lemonade stand : ). 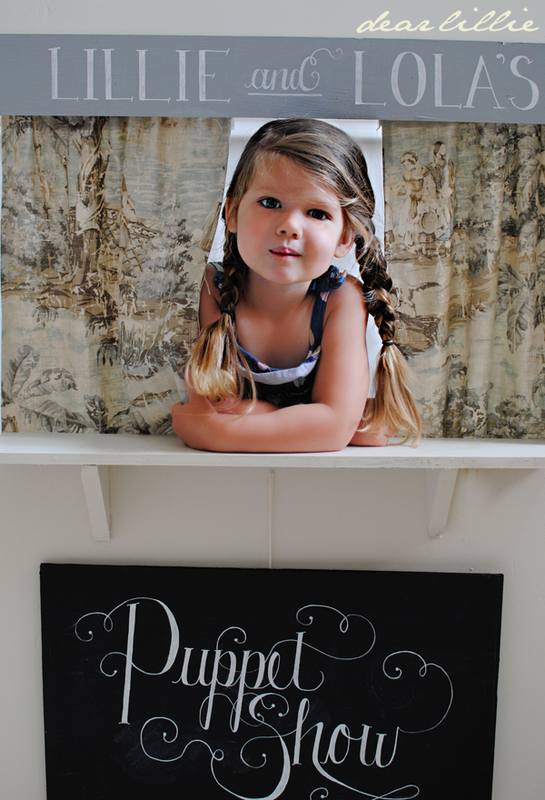 Forgot to say that before, but so dang cute! GGGAAAAAHHHH! That's so cute i think i'm gonna die... They will have sooooo much fun with it! And just think of the imaginative play it will create. PLUS, it has one of my very favorite fabrics in the world for the curtains. I'm so sorry i won't be there in person for one of the conformances! WOAH!!! 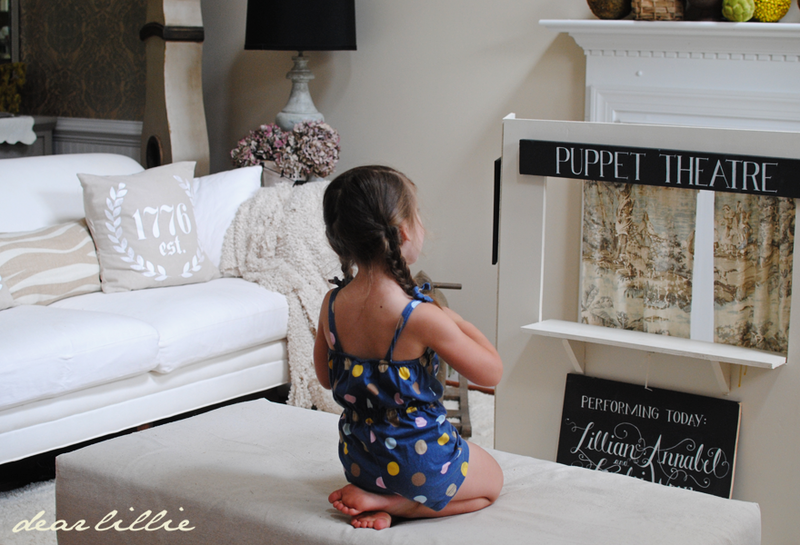 Lillie looks so grown up in her little romper! I can't believe it!! Love you Jen Pen! Haha - I know! Dana got it for her last summer but she's grown like crazy so when she put it on I told her I thought it was too small. She said, "That's okay mom, it can be my workout outfit!" Haha! Sooooo cute. Everything you do has such great details. 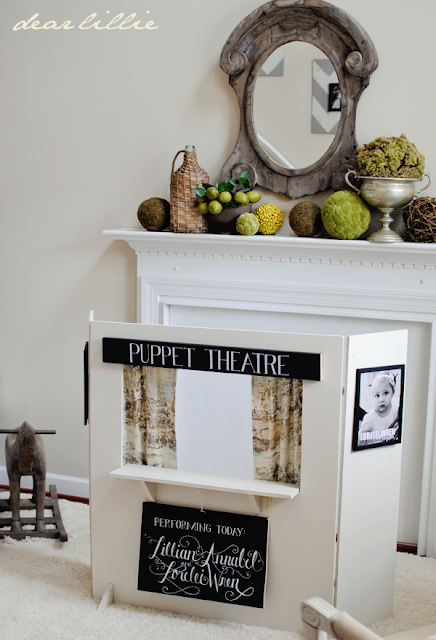 Cutest puppet theatre ever Jen!! 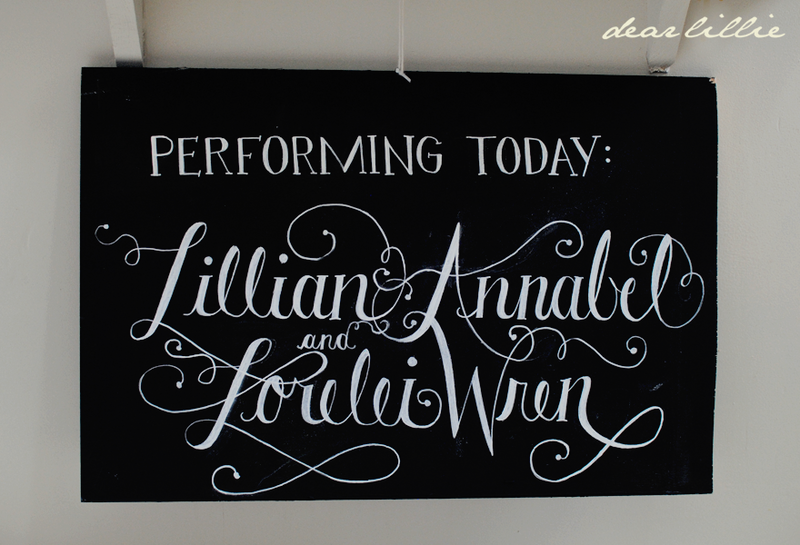 How fun for the girls, and what a trooper you are to be the audience for so many repeat performances! 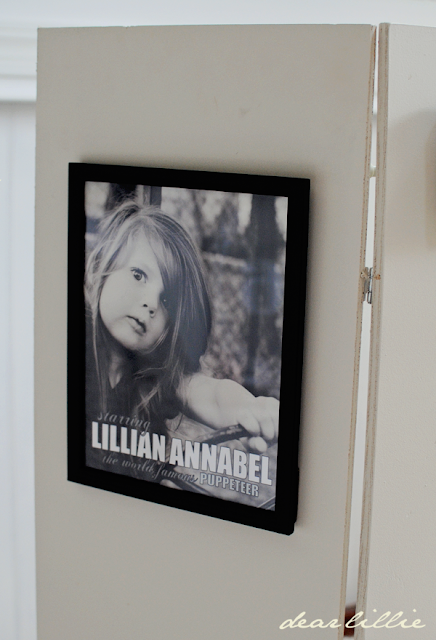 I always think how do you not put bright girly florals on your kiddie projects? 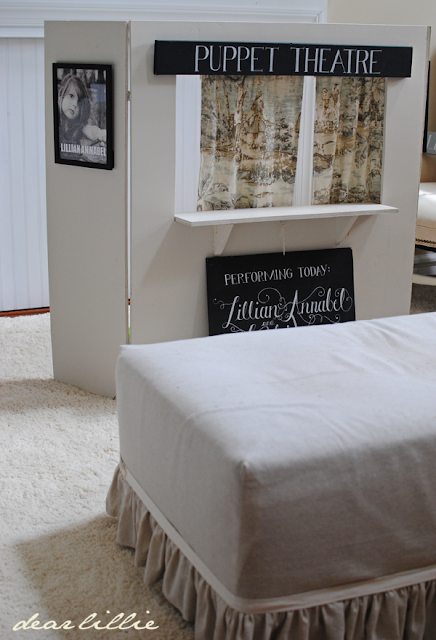 You do it with your pretty subdued neutrals and it looks so elegant yet still playful! Nice job~and I agree about your handwriting...perfection!! 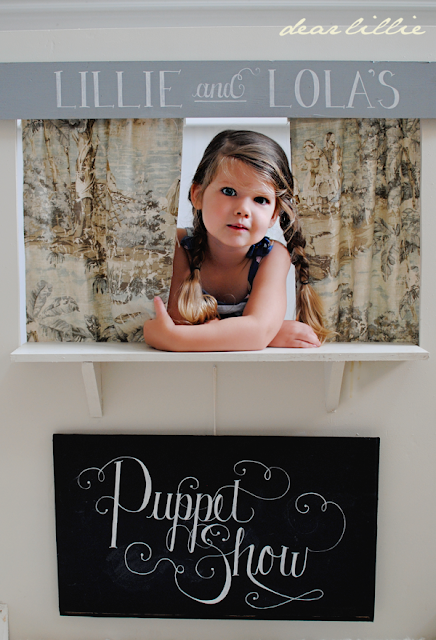 So beautiful and a lovely feature to for the whole family! This is the most precious thing I've ever seen built for a child! It's so sweet that they get to play and interact with each other and an audience. And with no video games or Ipads! 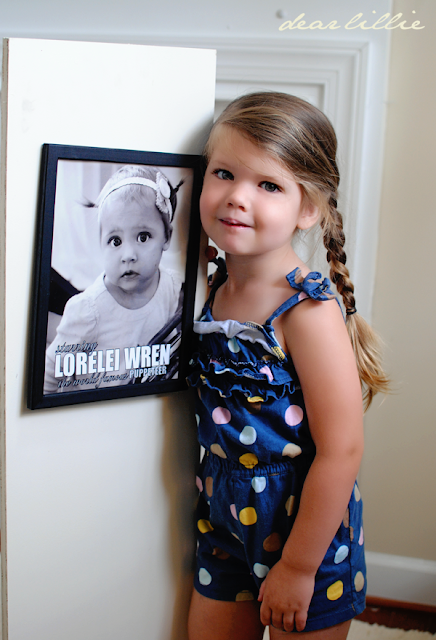 I wish I had done something like this for my daughter when she was "little". I love the new pillow. That's one of my favorite poems and I love the idea of hope being something that can take flight. I would LOVE to see how you made this! 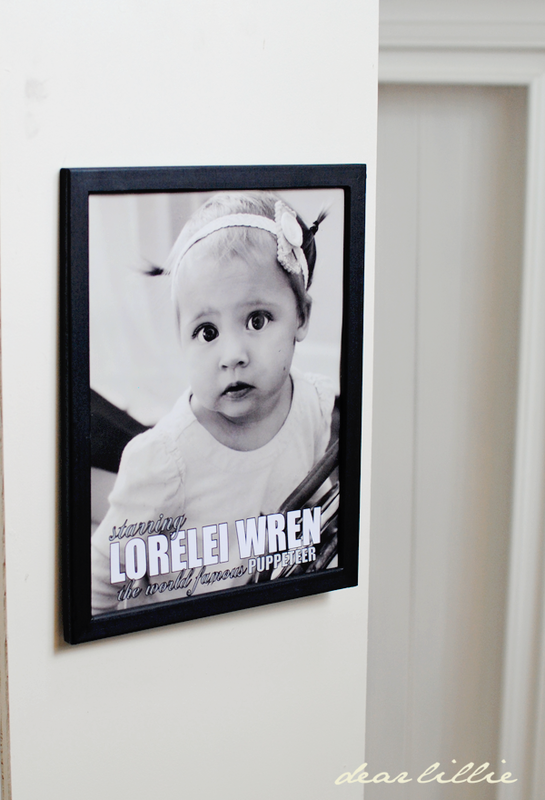 I HAVE to make one for my nephew! TOO FUN!! Maybe you could sell just the writing somehow? P.S. 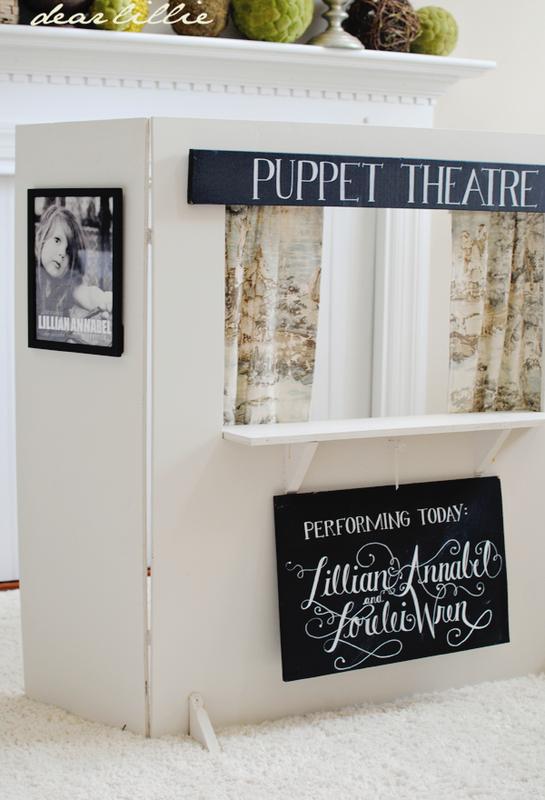 I also LOVE the fact that it can change from a puppet theatre to ice cream / lemonade stand! I CANT WAIT to see the tutorial! Your girls are so adorable. You capture some of the most beautiful images. Any way you could show us how you hang the sign on? In the lemonade stand post you said something about sawtooth hangers and then in this post, nails? I would love to know how to do it so they are easily interchangeable. Thank you! Hi, Brooke! The backs of the signs have sawtooth hangers, and then there are nails on the structure itself that the hangers rest on. Hope this helps! Just wondering what type of wood you used? I want something sturdy, but yet not to heavy! It was so long ago, I have no idea--sorry!